Do you remember when Clint Eastwood was a mayor? Well I do, and that was in Carmel California. I took a drive down to this adorable little wealthy seaside town to check it out. Man, is this place so cute it makes me want to puke. It’s just all adorable trinket stores, adorable restaurants, and antique shops. And I think the media age of its residents is about 65. I felt like a baby. After walking around for awhile, I stopped at the Village Corner for lunch. 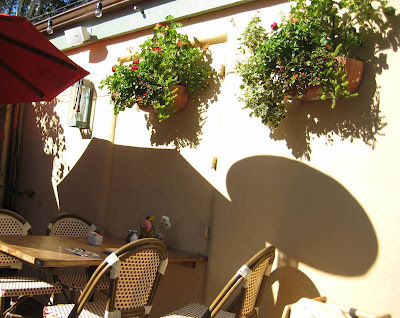 It has a nice outdoor patio area. While they did have some umbrellas, it was mostly quite sunny. Normally it would have bothered me, but I decided to soak it in. 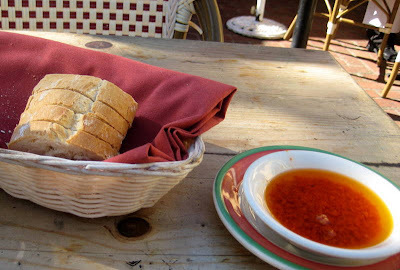 Some complimentary bread. Nothing worth noting, really. This salad was definitely worth noting. 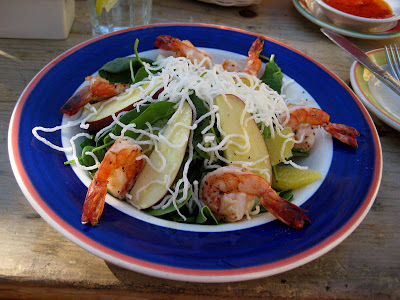 This is the baby spinach with grilled prawns salad, with apples, crisp rice noodles, and a sesame orange vinaigrette. The apples were getting towards the mushy side, and the vinaigrette needed a bit more zing, but otherwise, I loved this salad. The prawns were big and well cooked and it was just a perfect summer type salad. The service, on the other hand, kind of sucked. I had to wait super long to get a menu, and the server was just terrible. And the worst part is that she knew it. One of the regulars even joked about it. He said “let us know when you get your waiter license”. I’m afraid she will never pass!